(Marmarica- Lybiae- Aethiopia Sub Aegypto- northern Africa). Issued Basel, 1579 by Henri Petri for. Pomponii Melae de Orbis Situ. 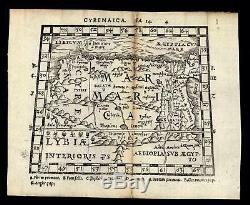 Charming and quite rare 16th century woodblock miniature map. Names the fictitious Mountains of the Moon range which is shown here cutting across the center of the continent. In Fair mostly clean condition, original centerfold split and now backed with matching old paper on reverse (virtually no loss, scan reveals condition). 7 1/4" W x 6 " H. 6" W x 4 3/4" H. We do not sell modern reprints. 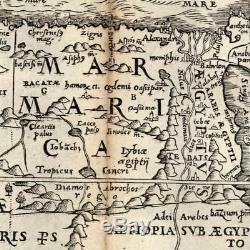 The item "Africa north Marmarica Mts. Of moon Aethiopia 1576 Petri rare old miniature map" is in sale since Sunday, March 11, 2018. This item is in the category "Antiques\Maps, Atlases & Globes\Africa Maps". The seller is "oldmapsoldbooks" and is located in Dover. This item can be shipped worldwide.